1、 The most typical symptoms of lymphoma are painless superficial lymph nodes, which grow gradually with smooth surface and in the hardness like nasal tip. 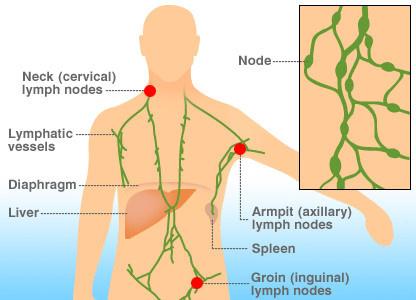 Swelling lymph nodes are most commonly occurring in neck and supraclavicular regions, after that are in armpits and inguens. Some cases would mainly present the symptom of swelling lymph nodes deep in body, for example, swelling lymph nodes in mediastinum, abdominal cavity and pelvis. Those cases come with an insidious onset that when the patients are diagnosed lymphoma, the swelling lymph nodes deep in body normally are every obvious to note. 2、Progressive swelling lymph nodes may affect or press on tissues or organs around and cause correspondent symptoms. For example, when superior vena cava is pressed by the swelling lymph nodes in mediastinum would block blood backflow to cause swollen face and neck, chest distress, chest pain or difficult breath and so on. If the swelling lymph nodes of pelvis and abdominal cavity press on gastrointestinal tract, ureter or bile ducts etc. would lead to intestinal obstruction, hydronephrosis, jaundice, which may also come with abdominal pain and distention. 3、Expect lymphatic system, lymphoma can also encroach on other organs and present correspondent symptoms. For instance, gastrointestinal lymphoma would show the symptoms like abdominal pain, gastrointestinal ulcer, bleeding and oppression etc., which are same as stomach diseases and intestinal cancer do. Lymphocytoma cutis is normally mistaken as psoriasis, eczema and dermatitis. If the tumor develops in brain, headache, blurring vision, disturbance of speech, unconsciousness, and change in disposition, dyskinesia of limbs or whole body, and even paralysis in severe cases. When tumor invades bones can lead to pain or fracture of bones, and if in nasopharynx may develop symptoms like nose obstruction, running nose, nasal bleeding, which are similar to the ones of nasopharyngeal cancer. 4、Lymphoma is a general disease, except the above symptoms, fever, night sweat, acratia, emaciation, loss of appetite, rash, itching, anemia and other systematic symptoms may develop in more than 50% patients. From this, superficial lymphoma comes with obvious symptoms that are easy to find early. But for the lymphoma develops deep in body, it is difficult to note because concerning symptoms would occur when the tumor is large enough.